The first casino to open in the southeast was on a riverboat at the Isle of Capri in Biloxi, and a quarter-century later, three of the “Pioneers of Riverboat Gaming” will be together in Biloxi for the Southern Gaming Summit. Lyle Berman, co-founder of the Grand Casinos; Timothy Hinkley, former president of Isle of Capri Casinos; and state Sen. Tommy Gollott will share their stories, lessons learned and what the past might tell us about the industry’s present and future. Lee Dillard, AGM/VP Finance for Caesars Entertainment, will moderate the session at 10:15 a.m. May 4 at the Coast Convention Center. The 25-year history of casinos in South Mississippi began at 10 a.m. sharp Aug. 1, 1992, when Gollott tossed out the first dice aboard the Isle of Capri riverboat. Years later, he would fight to get state legislators to approve land-based casinos to help the industry recover after 2005’s Hurricane Katrina. Executives at four Biloxi casinos look back at 25 years in the casino industry, how the community has benefited and what is ahead. 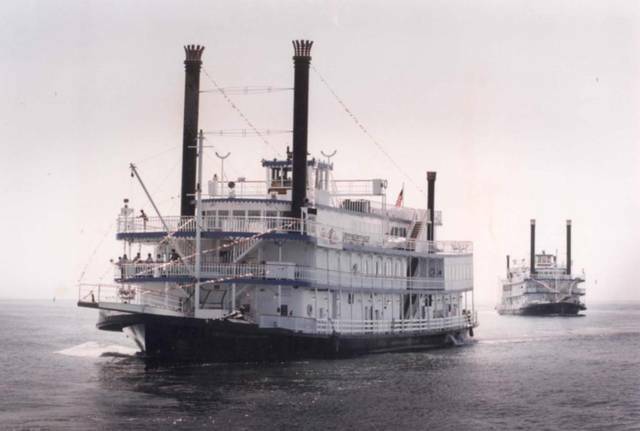 The 1880s riverboats, Diamond Lady and Emerald Lady, took a week to come down the Mississippi River from Iowa to take their place in history at the moorings in East Biloxi. The late Bernie Goldstein was founder of Isle of Capri and was known as the “father of riverboat gaming.” Tim Hinkley was president of the Isle of Capri. Berman co-founded Grand Casinos Inc. in 1990 and was inducted into the Gaming Hall of Fame Class in Las Vegas last year. He built Grand Casinos in Biloxi and Gulfport, and in 1995, Fortune Magazine named Grand Casinos the fastest-growing company in America. “He was a true pioneer in our industry, especially down on the Gulf Coast,” said Larry Gregory, executive director of the Mississippi Gaming and Hospitality Association, which co-sponsors the Southern Gaming Summit with BNP Media Gaming. Other highlights of the May 2-4 summit will be the Global Gaming Women Luncheon at Scarlet Pearl Casino on May 2, the welcome reception at Beau Rivage Resort & Casino on May 2, the keynote speech by James Allen, chairman of Hard Rock International and CEO of Seminole Gaming on May 3 and the opening-night party at IP Casino Resort on May 3. Early registration with reduced pricing runs through April 15.